MUSKEGON, Mich. — Jordan Lee is on the road to redemption. 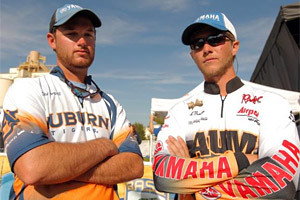 The Auburn University senior brought in 15 pounds, 2 ounces of bass Friday to lead the first day of the Carhartt Bassmaster College Classic Bracket by almost 6 pounds over his closest competitor (Day 1 results below). "I killed it today," Lee said. "It feels really good, and it's a big surprise. If you'd told me yesterday I would have 15 pounds today, I would have laughed." Lee went to the wire last year against his brother Matt Lee in the bracket-style competition for a Bassmaster Classic berth, but Jordan lost. He had to look on as Matt competed in the 2013 Classic on Oklahoma's Grand Lake. This year, Jordan is determined to win the competition and be part of the 2014 Classic on Lake Guntersville, a body of water he fishes about 30 times a year. "I told myself I have to work harder than I ever have to make it to the Classic," Lee said. "Just making the Classic was huge for Matt last year. I want to compete at that level, especially on Guntersville." This week's bracket-style competition on Michigan's Grand River pitted Lee against Brad Rutherford of Young Harris College, who shook his head and tried to verbalize his disappointment at the one 1-pound, 7-ounce bass he brought to the scales. "I just never figured it out here. I don't know why, but it never worked," Rutherford said. Lee caught four fish fairly early Friday morning for a total of 8 or 9 pounds. He decided if he could get one more keeper, he would then move on to target bigger bass. His strategy worked. His biggest bass weighed 4 pounds, 1 ounce, and he caught it on a pattern he began working around noon. "I'm using a pattern that should hold up tomorrow, but it won't work in the morning," Lee said, declining to be specific. "The last three or four hours of the day are the best times to use it." Lee's Auburn University teammate, Shane Powell, brought in 9 pounds, 3 ounces and won against the competitor in his bracket, Young Harris College's Matthew Peeler, who had 3-7. Like Lee, Powell caught his bass on an afternoon bite. "Catching my fish had more to do with the area than the bait," Powell said. "I caught a bunch of small ones in the morning, but after 11:30, the bite picked up. The key is being able to adjust. That used to be my biggest problem — being closed minded, but adapting worked out well today." Peeler found a spot in practice that he thought had the potential to produce, but when he pulled up on it, he found it full of salmon. "I guess salmon and bass don't mix," Peeler said. "I thought this would be a great grass bait area, so I ran that pattern. It was go big or go home, and I'm going home. But I'm not holding my head down for one second. This has been an awesome experience, and this contest was an unbelievable way to cap off the season." Tom Frink of Auburn University at Montgomery, who was on the winning team of the Carhartt Bassmaster College Championship, boated 8 pounds, 5 ounces of bass in the opening round, but that wasn't enough to overtake his competitor in the bracket, Nick Barr of Eastern Washington University, who had 9-4. For Barr, a frustrating practice gave way to success on the first day of competition. "Practice got so tough that I got spun out, and you can't come into a contest like this stressed," Barr said. "You have to keep your perspective. I wrote on my hand today, 'Have fun!' That's what I was doing. I tried a pattern that I never in a million years would have thought would work, but it did." Jacob Nummy, Frink's AUM teammate, brought in one bass weighing 1 pound, 13 ounces, but it was all he needed in his bracket. Nummy was visibly upset for his fishing buddy when Frink was knocked out of the game. "I'd much rather it be me," Nummy said. "This really feels worse than losing." Despite his disappointment at Frink's absence from the second round, Nummy is putting together a plan for Day 2. Nummy said he had several bass attack his lures today, but they wouldn't commit. "I didn't 'sore-mouth' them, so the bass are still there," he said. "I think the water just has to warm up for the shad to pull up and for me to capitalize on my time fishing. The fish are there. Things have to go my way tomorrow. I'll have to calm down and fish slower." Nummy bested Jarred Walker of Eastern Washington University, who had a successful practice, but zeroed today after the bass he caught came up too short on the measuring stick. Walker, who played college football, enjoys the individual challenge bass fishing provides. "I like bass fishing, because it's not a team sport where you can say someone else did something wrong," Walker said. "It's all on me — there's no one else to blame. It's humbling. One day you're at the top, and the next day you're not." The angler at the top on Sunday will receive an invitation to compete alongside the pros in the 2014 Bassmaster Classic out of Birmingham, Ala., Feb. 21-23. He will also receive $5,000 from Carhartt and the use of a fully rigged and college-color-wrapped Toyota Tacoma to pull a Skeeter FX20 powered by a Yamaha SHO 250. The winner also will receive entries for the Bass Pro Shops Bassmaster Opens Series of his choice. Four anglers will continue the Carhartt Bassmaster College Classic Bracket battle on Saturday with their weights zeroed. The pairings are Eastern Washington University's Barr vs. Auburn University's Lee. Auburn University at Montgomery's Nummy will oppose Auburn University's Powell. Those anglers return to the water Saturday. 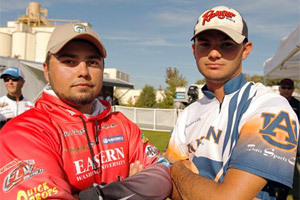 In the final elimination round Sunday, two anglers will face off, again on the Grand River. The competition is part of Toyota All-Star Week, Sept. 27-29, in Muskegon, Mich.
Takeoff each day will be at 7:15 a.m. ET at Fruitport Charter Township Public Launch. The college anglers will weigh their catches at 4 p.m. ET at Heritage Landing, 1050 7th St., Muskegon, MI 49440.